Tag Archives for " Shinola "
Shinola is a hot brand. The start up retailer has recent appearances in CBS News, Entertainment Weekly, GQ, New York Times and a host of daily newspapers and news shows to prove it. First off, let’s face it, Shinola is doing something a little unique. They are manufacturing low priced, upscale watches in a newly opened factory in the US – in Detroit to be more specific. In addition to watches the brand has sourced US made leather goods, bikes and a handful of decidedly upscale accessories to round out their retail offerings. The company currently has three stores in Detroit, Kansas City and Manhattan. Shinola is tapping a proven formula for branding success – a compelling story. Not just a great story in the that’s entertaining kind of way, a great story in that it allows people come on in and feel like that are joining something valuable as a way of expressing their values. The story invites us to support a social cause of sorts, to fight back against hard times, to support something hand made in Detroit. An introductory video on Shinola’s site starts with this line. Welcome to Detroit the new watchmaking capitol of America. We believe in the beauty of manufacturing and the glory of industry. Almost every element of the Shinola brand promotes the resurgence of American industry and uses Detroit, perhaps the greatest symbol of the hard times faced by American industry, as the backdrop and rallying cry for joining the movement. 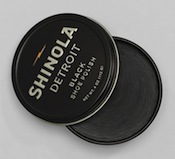 To anchor this heritage kind of feel, founder Tom Kartsotis researched, found and purchased the rights to the once popular Shinola shoe polish and used this in conjunction with a Detroit manufacturing plant to create a brand narrative that allows people to dream a bit about why buying a Shinola watch is aspirational. Now, here’s the point where I need to inject for the sake of balance that Kartsotis is the founder of Bedrock Brands, also the founder of the popular Fossil brand of watches. Shinola is no bootstrapped start up struggling to invest in becoming a part of the American dream, but they have showcased the power of a great story, a story people can tell themselves, in building a business. The Shinola brand clearly uses its story to tug at the heartstrings of those wanting a return to the values and virtues of a time gone by when American manufacturing ruled the world and for that they have critics who question their authenticity. When you bank on a great story you take risks and, like any great story, you need to live the story to make it so.